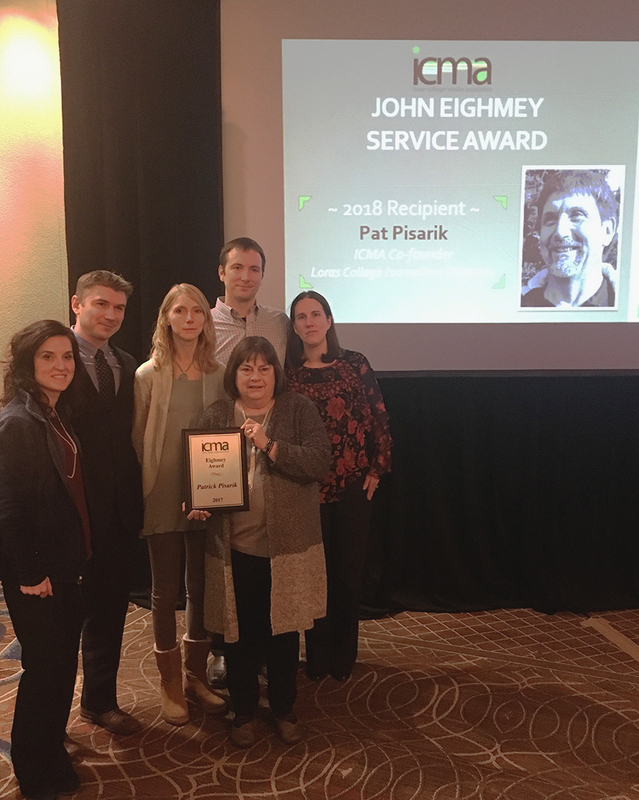 The Lorian and LCTV were among the many school organizations to receive awards for their efforts, but this year the association also honored the legacy of one of its co-founders: Loras Professor Patrick Pisarik. Photo by Kayla Thompson. The Pisarik family poses with the Eighmey award. Professor Pisarik was voted this year’s recipient prior to his Oct. 30 passing, and his family accepted on his behalf. The final award of the conference is named after Dr. John Eighmey, a former Iowa State University journalism professor. According to the ICMA website, it is given annually “to recognize an individual whose efforts have been instrumental in advancing the quality of media education in Iowa.” It is considered the highest recognition of the event. Media-studies professor Craig Schaefer had the privilege of recognizing his late colleague and friend as this year’s recipient. Pisarik was one of several nominees the ICMA board considered in early October. He was selected prior to his passing on Oct. 30. Only the board member who tallies the votes gets to know the winner until the ceremony, but circumstances were different this year due to Professor Pisarik’s passing. Schaefer was alerted of the news and shared it with the Pisarik family shortly after the funeral, then helped arrange for them to accept the award on his behalf. Professor Pisarik’s wife, LeAnn, and three of his four children — Christopher, Jesse, and Stephanie — as well as other family members were present at the award ceremony. Christopher, the eldest Pisarik son, said a few words on his father’s behalf. He thanked the association for the honor and encouraged the student journalists to work hard and continue his father’s passion. Pisarik helped found the ICMA and served as both vice president and president. “Professor Pisarik sought to build an association for students to come together to learn and share from other students, advisors and professionals,” Schaefer said. The ICMA Board of Directors also unanimously voted to rename the student journalism award to the Patrick Pisarik Student Journalist of the Year. LCTV executive news producer and Loras College junior Kelly Kuboushek was one of the three finalists for this award. Outside of Loras, Pisarik worked in the news media world, serving as a graphic designer and photojournalist for the Cedar Rapids Gazette. 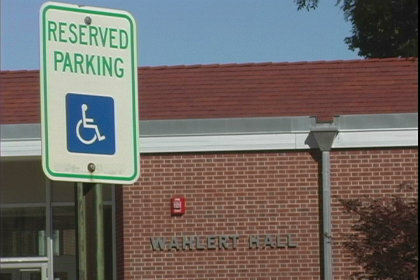 Prior to teaching at Loras for nearly 25 years, he taught at the University of Northern Iowa. He also served as moderator of The Lorian for many years. Despite his sudden passing in October, his legacy will continue on through the Loras community and the collegiate media association. To learn more about the association, please visit their website.